The ultra-compact, mountable AG-HCK10 HD camera head (POVCAM) teams with the AG-HMR10 AVCCAM handheld recorder to offer a low-cost Full HD camera recording system for a wide range of applications. Connected to the HMR10 recorder with a detachable cable, the HCK10 captures 1920 x 1080 high definition video using three 1/4.1" 3.05 megapixel 3-MOS imagers for recording by the HMR10 recorder in the AVCHD format, which provides double the recording time and higher quality than older MPEG-2 compression used in HDV formats. 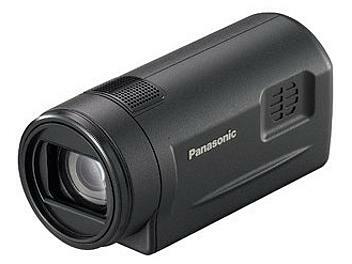 The camera head features a 12X optical zoom lens with 10X digital zoom, (up to 120X), optical image stabilizer (O.I.S. ), a built-in 2-channel microphone and a range of advanced tuning functions, including matrix, knee point, adjustable detail and chroma, white balance and zebra settings. Iris, focus and zoom are remotely controlled by the HMR10 recorder. It is powered by the HMR10 recorder. [59.94 Hz] 60i/60p mode: 1/60.0 sec. to 1/250.0 sec. 30p mode: 1/30.0 sec. to 1/250.0 sec. 24p mode: 1/24.0 sec. to 1/250.0 sec. [50 Hz] 50i/50p mode: 1/50.0 sec. to 1/250.0 sec. 59.94 Hz] 60i/60p mode: 1/2 sec., 1/4 sec., 1/8 sec., 1/15 sec., 1/30 sec. [50 Hz] 50i/50p mode: 1/2 sec., 1/3 sec., 1/6 sec., 1/12 sec., 1/25 sec.